Lifecycle funds are designed for investors to simply select the Lifecycle fund that corresponds to their retirement date (such as 2040 or 2050). Both Vanguard and the government's TSP program offer Lifecycle funds. The Lifecycle funds adjust allocations internally so you don't have to. While this is simple, we will look at the consequences. The Lifecycle fund investments are "professionally" determined based on mainstream thinking on how investors should be diversified to reduce risk as you grow older. 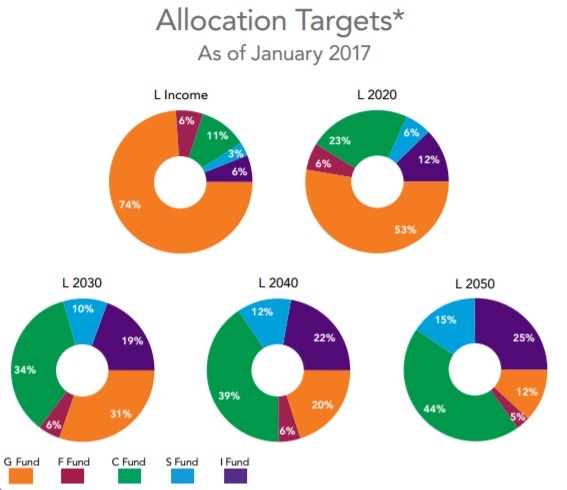 The allocation mix is adjusted to be more "conservative" as one nears retirement and then moved into a very low risk (and return) income producing fund in retirement. It sounds good so far. A main take-away from this page is that the entire concept of how Lifecycle funds are allocated is based on a theoretical returns that does not take into account where the markets are today in terms of both interest rates and stock market valuations. The investment strategy assumes that the greater number of years you have until retirement, the more willing and able you are to tolerate "risk" which portfolio managers define as merely fluctuation in your account in order to "pursue" higher returns. The idea is that for a "given risk level" and time horizon (your retirement) there is an optimal mix of investing in stocks and bonds to provide the highest "expected" return. The next graph comes from the TSP Factsheet on Lifecycle funds. Here we see how allocations differ based on your target retirement date (plus or minus 5 years). 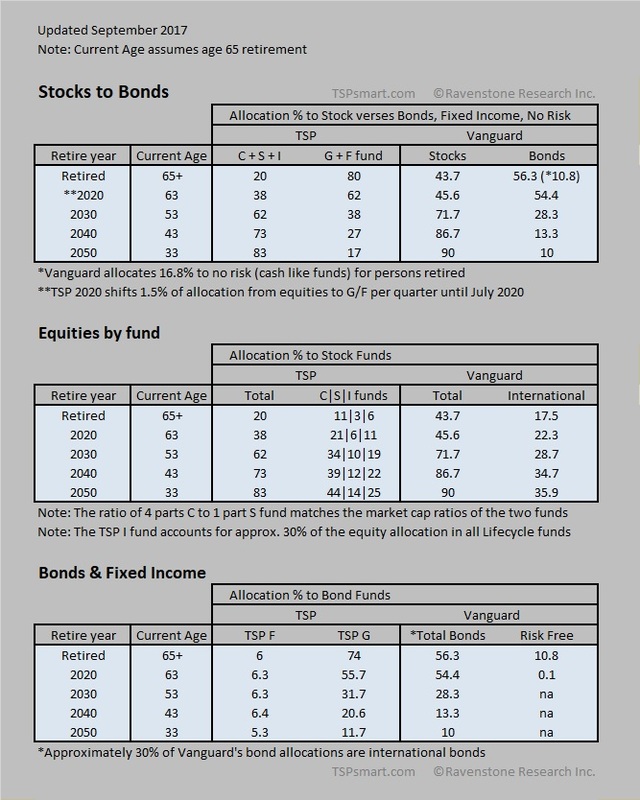 Note the "L Income" fund is for those who are retired and can not afford to take large losses so it is holding 74% the safe TSP G fund and only 20% in stocks. It is important for investors to understand that the Lifecycle fund's primary strategy is buy and hold no matter where we are in the stock market cycle. The unwritten assumption of these funds is that market risk and "expected" future returns are static - which is far from reality and easily observable on any long term chart. The true risk of investing in any fund is the risk of significant losses and this risk changes over time and is more pronounced the higher market valuations become. The fact sheet never adjusts their marketing to interest rates or valuation levels that are highly correlated to future long-term returns. You will note my added in curve circled in green is based on the next 10 years and not the lifecycles beyond 2030. If the equity funds drop in price over 50% relative to sustainable earning streams, only then can you expect something close to the fact sheet's curve. The L income fund only took a 10% hit due to its low holdings of stock funds during the 50% bear market as it was designed to do and this is a good thing for retirees. I have the least amount of concern for the Income Fund once investors move to it, although I do think its returns can be improved without taking on more risk. In the price chart above we see it took all the Lifecycle funds as well as all the equity index funds over five years to catch up with the lowly TSP G fund after each decline. 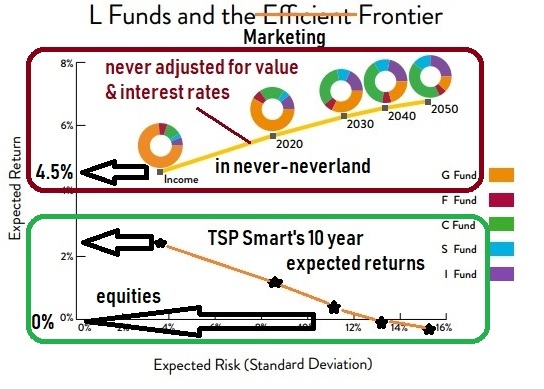 Please do not get the idea the F fund is a better investment today because it outperformed the TSP G fund since 2007. The largest allocation TSP gives to the F fund in Lifecycle funds is only 6% for all age groups! There is a reason for this. As you move to the farther retirement dates, one could argue that the market cycle matters less and thus using the past average returns to market the expected future returns is justifiable. With 85% of the 2050 fund invested in stocks, using an 8% average gain on the stock market looking back leads you to an expected return of 7% in the chart above. Please realize that I am not mainstream in defining "risk". My definition of risk is avoiding taking significant losses on your holdings and not just reducing volatility to the up and downside. Yes, the Lifecycle funds are less volatile but in the end, but the price is a smaller nest egg in retirement than someone who simply avoids the bulk of the bear markets. Please review our Seasonal Investing section to understand the overall strategy. 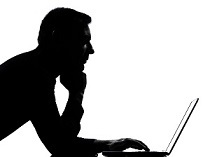 This strategy has significant academic and real-world backing, but is not popular with fee earning advisers and funds. The basic premise is to avoid stocks the 6ish months of the year that (on average) under-perform safe interest bearing funds. It's that simple. By doing this you cut your exposure to stocks by 50% and this could allow you to hold a higher percentage of stocks during the favorable months than you might otherwise - the months with the fewest and smaller market corrections. 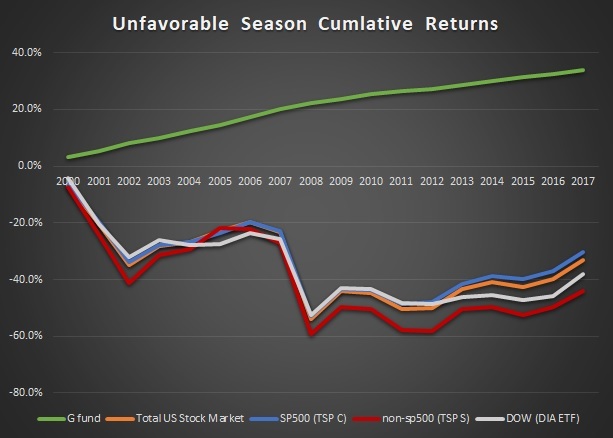 The graph below shows the cumulative returns of being invested only during the unfavorable season for equities (summer/fall) based on our Bellwether signal. 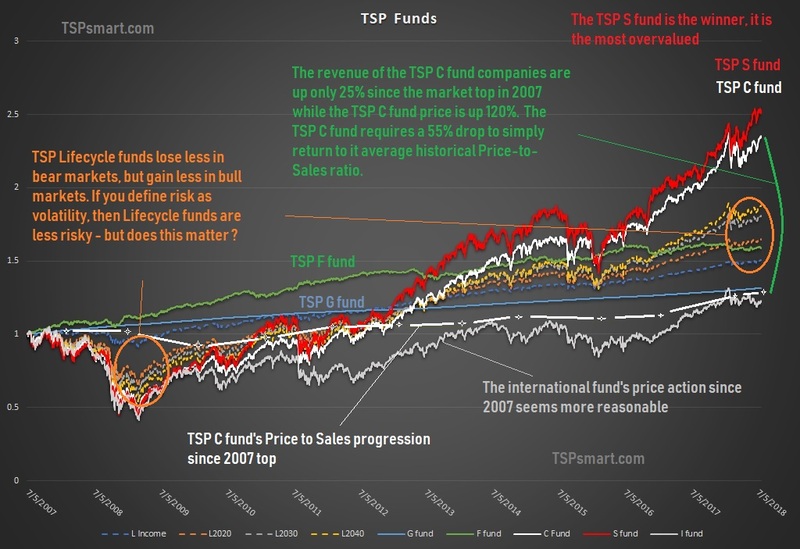 The green line is the TSP G fund, all others are equity funds. The chart above shows you how you end up with the results in the next chart. The dotted blue line below is the buy and hold performance of the TSP C fund (SP500). It shows a respectable 160% gain since 2000 which was turned into a 400% gain by simply sitting out the summer and fall each year in the TSP G fund. The red line shows the effect of seasonal investing on the small cap TSP S fund. Small cap stocks are more volatile in general to include seasonally which makes them the best candidate for season investing. 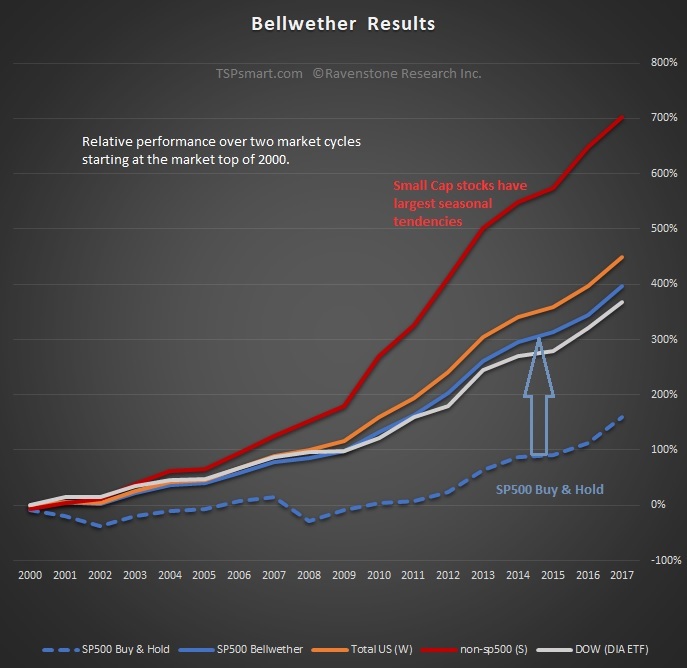 To learn more of how you can reduce risk while increasing your returns read about what we think is absolutely the best TSP strategy and how it can also be applied to any retirement account or learn how the Bellwether timing signal evolved. Both the Vanguard and TSP Lifecycle fund investment allocations were set by professional investment consultants who are investing for the typical investor. So what better baseline data to start with for your own allocation percentage decisions. We will be discussing the limitations of these funds - basically they are buy and hold funds that do not avoid market risk in general, just diversify it. Before delving into the table, I want to make clear that I do not like lifecycle funds and I only present the data so you can obtain a rough guide as to what your baseline allocation to equities should be based on your age. I do not like lifecycle funds for the same reason I do not like the buy & hold mantra of wall street. Buy & hold investors take significant losses that take years to get back to where their balance sheet started. I do not espouse speculation and trading either with one's nest egg, but I strongly believe there are times when market risk (risk of significant losses) is elevated and you should not be in the market, period. Eight years of bull market gains can evaporate in a very short period of time. Why the last ten years matter? The market cycles in less than 12 years in bull and bear markets. If the market tanks when you have 9 years to go to retirement, there will probably be another bull market to regain some of your losses. If it tanks with 2 years to retirement, you will take the hit but miss most of the bounce back during the follow-on bull market with lower equity holdings. Another major assumption is that the market always bounces back to a new high and this may be tested after the next bear market. Japan's stock market still has not exceeded its 1989 bubble top. Of course, the better solution to holding until the market "always" bounces back, is we need to avoid most of those bear market losses and significant corrections all together. As for international exposure in the international funds, the S&P 500 index (TSP C fund) has significant exposure overseas and if the US economy and markets tank, the rest of the world will too. The MSCI EAFE index fund (TSP I Fund) invests in 85% of the developed world's listed companies (does not include US, Canada and China). The SP500 index receives over 38% of its revenues from international sales. If you add in an international fund you are actually over-weighting international stocks. I another issue with MSCI Developed World index funds (TSP I fund) - it is highly exposed to financials and has little technology exposure. All the global large tech firms are US companies or listed in the US. In today's world, the financial industry is at great risk (low interest rates & bad practices). Profit growth has been in technology and online retail and the leading world companies are listed in the US and not in Europe or Japan. Don't think in terms of geographic diversification with the funds, think of the US dominance in technology profits sitting in the SP500. Instead of diversifying with an international fund, I would stay focused on decreasing market risk in the US funds during times of market distress. The US market is also backed up by the world's reserve currency and a central bank that is the most capable of providing support to the financial markets. This support is not available in the rest of the world. One of the points I want to make here is that merely splitting your equity funds in 33/33/33% would not give you a balanced portfolio in terms of market capitalization, international exposure or high-growth tech exposure. It would actually work against diversification of the most profitable companies. An investment adviser who asks you what is your desired "level of risk" is no different than a used car salesman asking you what amount of monthly payment you can afford. Neither question is pertinent. You want the highest possible returns with the lowest possible risk. Lifecycle funds with their buy & hold strategy will get you neither.